A Ghanaian missionary, Apostle Isaac Attoh has been brutally murdered by soldiers loyal to Cameroonian President Paul Biya in Batibo, on the 14th July 2018, Batibo Sub-Division, Momo Division, North West and dumped his body on the walkway of one of the streets. According to family sources, Pastor Isaac formally of the Destiny Impact Ministry located in Barn Yard, Accra, Ghana who now runs his own Ministry; Isaac Attoh Ministry left Accra, Ghana by road on Tuesday July 10, 2018 for evangelical duties in Cameroon. Reports say the young and energetic Man of God arrived Batibo in Cameroon on Friday July 13, 2018 before being brutally murdered by the Cameroon military on Saturday July 14, 2018. 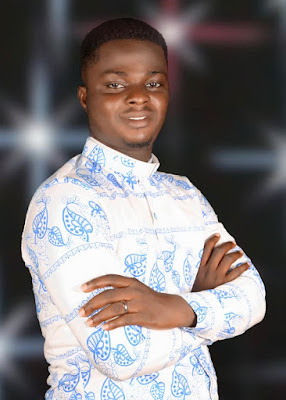 National Telegraph's secret stringers are now confirming that the corpse of the 28-year-old curate is presently at a mortuary in Bali, a neighboring town to Bamenda, North West Regional headquarters. Information also reaching the deceased family from Cameroon indicates that, the military is trying to bury the body to conceal the evidence. Observers have condemned the death of the Pastor but the church in Cameroon is yet to make an official intervention. Pastor Attoh was murdered alongside two other Ghanaians who are yet to be identified. 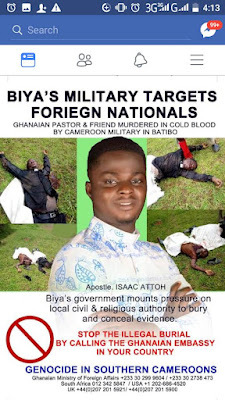 Efforts by some stranded Ghanaian pastors and friends, in Cameroon to retrieve the body of the deceased have proven futile, as the military is unwilling to release the body to cover up their heinous action. The wife, Esther Attoh has since been in shock, National Telegraph has been told. The young Pastor is third of four siblings. Rev. Isaac is survived by his wife and 2-month-old baby boy. Meanwhile, the family is calling on the Ghanaian Government and the International Community to intervene and get the remains of their brother ferried to Ghana for a decent burial.